This is the seventeenth novel in Virgin's Missing Adventures series. 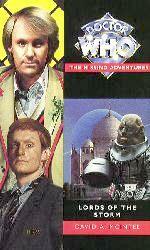 The Sontarans are a warrior race of clones who are involved in a very long-lasting war with the Rutan. In The Time Warrior the Doctor defeated a lone Sontaran called Linx who was using crude time travel technology to bring human scientists from the 20th Century to repair his spaceship, which had crashed in medieval England. He has subsequently encountered them on numerous occasions. The Rutan are a race of shape-shifters who have been in a very long war against the Sontarans. The Doctor encountered a lone Rutan in Horror of Fang Rock.